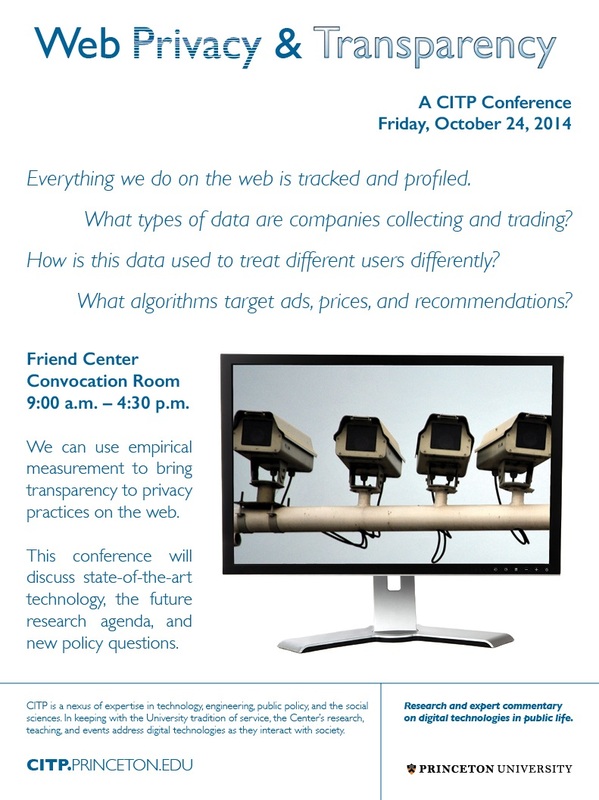 On Friday, October 24, 2014, the Center for Information Technology Policy (CITP) at Princeton University is hosting a public conference on Web Privacy and Transparency. It will explore the quickly emerging area of computer science research that aims to use empirical measurement to bring transparency to privacy-impacting practices on the web. The conference will discuss cutting edge research, will plan future work, and will ask questions of policy: What changes to law do these studies and measurements suggest? Can self-regulation be effective? How can web services work together with transparency researchers to foster a healthy public dialog? 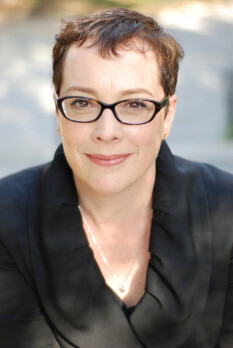 Pulitzer Prize-winning journalist and author Julia Angwin will give the keynote, and panelists include experts from leading universities, as well as the Electronic Frontier Foundation and AT&T Labs. This event has grown out of the work of many teams of technology researchers, developers, and advocates who measure threats to online privacy. One of these teams–the Web Transparency & Accountability Project (WebTAP) led by computer scientists at CITP–monitors websites and services using a state-of-the-art measurement platform developed at Princeton, which mimics user behaviors as it crawls the internet to gather accurate information about privacy practices. WebTAP researchers recently performed the first large-scale study of three advanced web tracking mechanisms: canvas fingerprinting, evercookies, and cookie syncing. That collaboration revealed startlingly widespread use of these trackers and demonstrated the need for a coordinated effort to observe web privacy practices and report on them to the public. This conference aims to bring together leaders in the field to strengthen that unified push for improving the transparency of online privacy practices. The external oversight provided by this research program can force companies to improve their behavior, help regulators take enforcement actions, and guide privacy tool developers. Like WebTAP itself, the conference also seeks to provide information for the public, and anyone can register to attend using the form on the CITP website. The Web Transparency & Accountability Project (https://webtap.princeton.edu/) is a Princeton-led coalition of technology researchers, developers, and advocates who measure threats to online privacy using the open source OpenWPM platform they have developed. The WebTAP team includes researchers from Princeton, KU Leuven in Belgium, and Stanford University, and it is partnering with the Center for Internet and Society at Stanford Law School, Common Crawl, and the Electronic Frontier Foundation. Information from past research is already available on the project website, and WebTAP welcomes inquiries from other online privacy experts interested in joining the collaboration. The Center for Information Technology Policy (https://citp.princeton.edu/) is an interdisciplinary center at Princeton University. CITP is a nexus of expertise in technology, engineering, public policy, and the social sciences. In keeping with the strong University tradition of service, the Center’s research, teaching, and events address digital technologies as they interact with society.